This book was written by Elizabeth Wein. This book takes place in Germany and the main character is named Celia. She has to deal with failure and hard times. I enjoyed this book. I like how the book is related to the book Night. They try to put the Jews into slavery and beat them the same way as [in] Night. I did not like reading about the mistreatment of the Jewish people. They were starved and did not get a lot of food. I think the whole book was a wonderful book and it explained things in great detail. I would give this book 5/5 stars. Although I had trouble getting through this particular book, I give it a "thumbs up". Sequel to Code Name Verity, this is another diary type book. 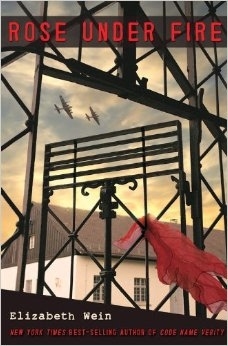 [This book is] the written story of Rose Justice, a young ATA officer who gets caught by the Germans. She tells not only her [story] but many [other] people's stories from her [concentration] camp, Ravensbruck. She also happens to love poetry and becomes friends with the "rabbits", people who were [the victims of cruel experiments]. This is a first class book for anyone who enjoys stories from [World War II].